We all tend to believe that mankind is on a path of continuous progress and ever-increasing prosperity, driven by good fortune and human ingenuity. Is that just wishful thinking or could it actually be true? I started looking into this question from a macro perspective in my previous post. I talked about the work of Ian Morris and his idea that sloth, greed, and fear are the key motivations for humans to seek change and thus drive innovation. Furthermore, he observes that today’s solution bears the seed of tomorrow’s problem, thereby thrusting mankind forward on a relentless innovation journey in order to keep problems at bay. But where is this journey going to take us? Is it ever going to stop? Could it be unstoppable? Could that be a valid explanation for unlimited progress, ever-increasing prosperity, eternal growth? Let’s find out. Morris offers valuable insights as he defines a numerical index to quantify social development in order to compare developments between different locations and across time ranges that reach back far beyond written history. As an established historian and archaeologist, he is only too aware that such quantification, and even more so his specific yardstick, will provoke objections and challenge, but that is not my point here (for those interested in the detail, he exposes his considerations, underlying data, and working assumptions online). Morris’s social development index comprises four components: energy capture, organisation, war-making, and information technology. Each of them has its own relevance, but energy capture clearly stands out as the first among equals for two reasons: energy capture starts out as a biological requirement for survival, as such it goes back to even pre-human history. And because it begins as a biological need, it forms the foundation for all human activity, including the other three components of the index. It directly relates human activity to the physical world of available resources, so you might view energy capture as an indicator for the potential constraints to social development. Think of it as the physical constraint to cultural evolution. So let’s see how Morris’ social development index evolved over time, especially its energy capture component. Did they always go up, up, up? 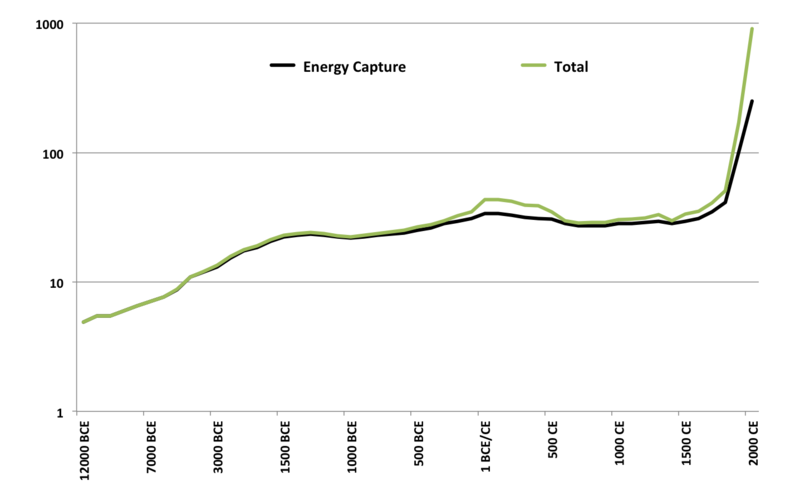 The chart reflects Morris’ data on energy capture as well as the total social development index (mind the log scale to make the ups and downs more visible). The data underpin to essential points. First, it is true that over most of human history, energy capture was the main factor in the total social development index. Second, social development is far from the assumed steady success story. Though the overall trend is clearly positive, there have been long periods of stagnation and even decline, lasting for several centuries. Only the data for the last two centuries actually display the rapid growth that we usually build our assumptions for the future on. However, the overall evolution of the index does not underpin those assumptions. Now, if you feel that this argument might be a bit too farfetched, take a look at a recent blog in The Economist. In When did globalisation start? the author reviews historic economic data since the 13th century, focusing on price inflation and how that related to major events such as the discovery of the Americas or the advent of the steam engine. Again, the analysis shows major periods of economic contraction rather than steady growth. Most remarkable of all: since the crisis beginning in 2007, there are signs that globalisation has actually retreated rather than expanded.